R.E.M. is one of the most influential American rock n’ roll bands. 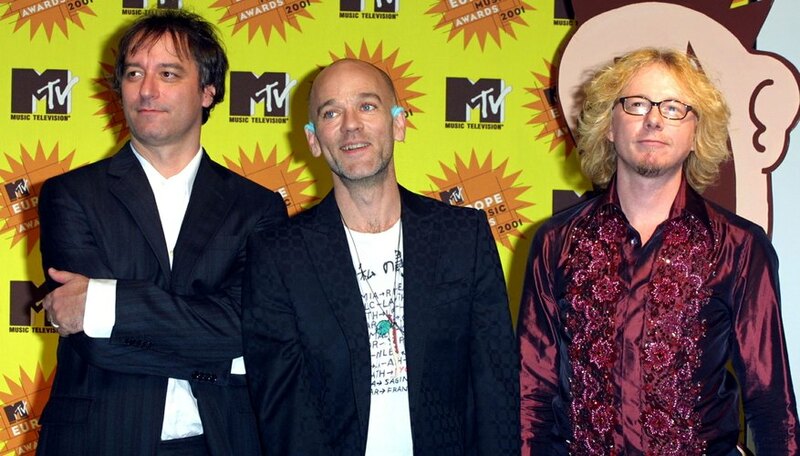 In a period that covered more than two decades, R.E.M. went from being the darlings of underground rock to a mainstream rock band that rivaled U2 in popularity. Michael Stipes’ esoteric lyrics blended well with Peter Buck’s retro-folk guitar styling to produce the unique sound that was at the heart of R.E.M.. Buck uses his guitar to create mood and atmosphere rather than to show off virtuoso guitar chops. Buck prefers to use basic major guitar chords such as C, G, A, D, and E and minor chords like Am and Em. Buck likes to play the chords in the first position on the guitar. These chords are played on first three frets. They combine fretted notes with open strings, allowing the chords to resonate and sound fuller. Buck also uses bar chords, like many rock and punk rock guitarists, when the song requires a heavier and more aggressive sound. Guitar students often worry too much about their fretting hand. They think the hand that frets the notes on the guitar neck is doing most of the work. The truth is that the hand that is striking and plucking the strings is doing equally important, if not more important work. This is particularly true for Buck. His right hand is doing the majority of the work that creates his sound. He plays arpeggios with a combination of picking techniques that include sweeping patterns and alternating picking patterns. Arpeggios can be played with a guitar pick, with the thumb and fingers and with a combination of guitar pick and fingers. Anyone interested in emulating Buck’s guitar sounds should consider his tools of the trade. Buck’s approach to guitar gear is pretty simple. In the early days his guitar of choice was a Fender Telecaster. He eventually swapped the Telecaster for a Rickenbacker 360, and the semi-hollow bodied Rickenbacker helped Buck to create his unique guitar sound. Fender amps and the Vox AC30 are the amplifiers that Buck uses most of the time. Another secret behind Buck’s tone is the guitar strings. Many rock guitarists use light gauge strings because they are easier to bend and play fast. Buck, on the other hand, tends to use heavier gauge strings Heavier gauges work well for playing chords and arpeggios. Salon: Peter Buck: "I Think We Were All Ready for a Change"
How Do I Play Folk Punk Guitar?